UPDATE: As of 3/24/10 there are five units remaining at the Sabine. Send me a message for availability. In a packed house, over 200 registered bidders showed up for the auction of 31 units at the Sabine on Fifth condos. 31 29 buyers walked away very happy, as this was believed to be the last great buying opportunity for attainably priced downtown Austin new construction. Where 27 units were originally intended to be auctioned, earlier in the week CWS (developer) decided to include three more, then in the final minutes of the auction they included another 1bd. The building has 80 units total. Once the 31 auction units close, there will be 13 new construction units remaining. These will be sold through traditional channels. 36 units closed before the now settled lawsuit was filed in February of 2009. During 2009, the 44 remaining units were taken off of the market due to litigation. This auction marked the “re-debut” of the Sabine. You’ll recall that the Brazos Place auction fetched an average of $281psf, and that was an avg 29% discount from original asking price. The ABJ’s Jacob Dirr scoops the high profile social media company’s move into Austin. Sources close to the deal said Facebook is still in the site selection process and is favoring downtown Austin. We’ve been leaning on our DAB Facebook fan page for quick posts. Check it out and become a fan! Downtown Austin Parks Becoming Enjoyable! What’s going on here? 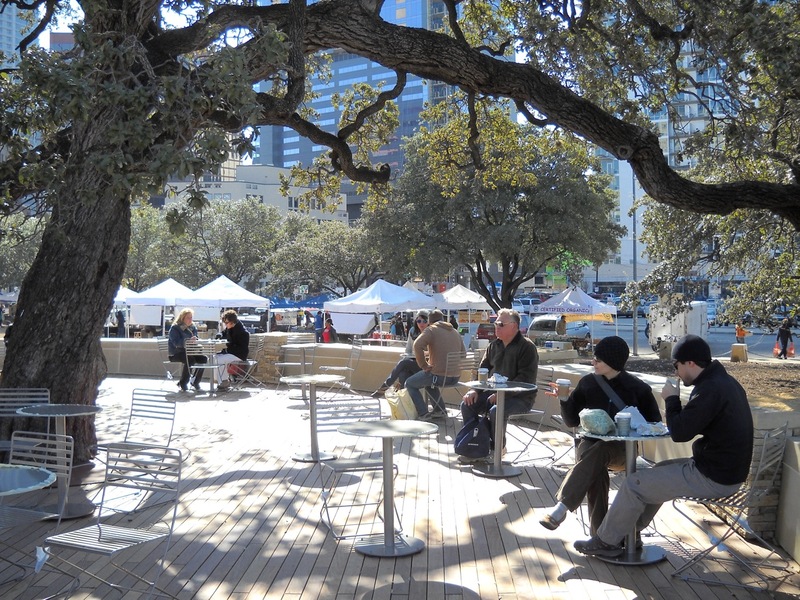 It looks like normal everyday Austinites are sitting, relaxing, enjoying a coffee at Republic Square Park in downtown Austin. Let’s hope this is a sign that our tax- and privately-funded parks will cease to be the exclusive domain of vagrancy.